This pattern is for crocheted Hawaiian fruit. It includes instructions to make a mango, pineapple, papaya, coconut, and banana. The fruits measure 4-7” each. 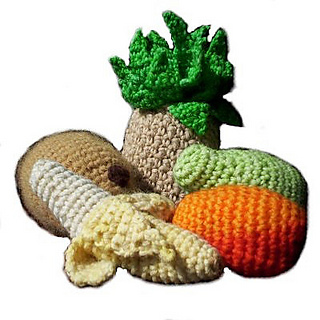 This pattern is a bit more complex than my original fruits and veggies patterns as it involves working through the back loops for multiple rounds and textured stitches.